Since mid-June 2012 there have been many surprising developments in Turkey's Kurdish issue. Nobody at the moment can say whether this is good or bad, but what is certain is that none of the long-held certainties hold true any more. Conflicting signals are coming from high ranking members of the Kurdish community, but the confusion may have created an opportunity. The Kurdish issue has occupied pole position in Turkish domestic, and also to some extent foreign, policy since the 1980 military coup. From the complete denial of any Kurdish identity and language, much has changed. Most of it, during the reign of the Justice and Development Party (AKP), which has been in power since 2002 with an absolute majority. However, the picture is ambiguous. On the one hand there have been political reforms allowing: the setting up of a 24-hour state-run TV channel in Kurdish and private TV and radio channels in Kurdish; Kurdish to be taught at some universities and allowed at political rallies and in prison among inmates and relatives. Recently it was decided that Kurdish will, from September onwards, be one of the newly introduced elective courses at school. On the other hand, especially since April 2009, there has been a wave of arrests (approximately 7,000, more than 3,000 imprisoned) of Kurdish politicians, functionaries and civil society activists, a number whom are ethnic Turks and students from abroad. Until last year the AKP’s strategy was to negotiate with the PKK (illegal Kurdistan Workers’ Party) via the MIT Secret Services both about laying down arms and political reforms (constitutional changes, mother tongue education, decentralization). These negotiations, known as the “Oslo talks”, came to a halt after the elections, which were held in June 2011. On 14 July 2011, the PKK attacked Turkish soldiers near the town of Silvan killing 13 soldiers, which was then interpreted as a reaction to the frustration that the talks had not materialized and to strengthen the position of imprisoned PKK leader Öcalan who has been held on an island in the Marmara Sea since 1999. As a reaction to these attacks, contact between Öcalan and the outside world was cut off. Meetings with family members and lawyers were no longer allowed. In March 2012, once again a so-called “new” strategy was indirectly announced through independent meetings with three journalists. According to this strategy, political questions should only be discussed with the legal party, the BDP. This basically had no impact at all. The arrests, confrontations and polarization continued. The mood in the spring of 2012 was the worst it had been in the past decade. The first reactions by both the PKK and BDP were negative. BDP co-chairman Demirtas said: “Whoever is hopeful about the prime minister is naive.” However, civil society and non-PKK related Kurdish politicians and activists reacted positively, signature campaigns were started, so that the BDP backed down. Days after the interview, they reduced their criticism to the mere fact that Zana had not informed them about it. Then from 18 to 20 June, Radikal journalist Avni Özgürel published a series of articles about a recent visit to the Qandil mountains in Iraqi Kurdistan where he also met the highest acting PKK commander Murat Karayilan. 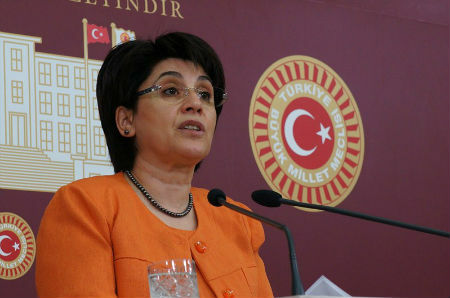 Özgürel wrote that Karayilan told him that the “PKK won’t attack military or police stations within Turkey, but would limit themselves to self-defence when attacked.” The day after this interview was published, the PKK attacked a military outpost near the Iraqi border in Daglica, killing eight soldiers and wounding 16. There are basically three possible explanations for this: First, Karayilan lied to Özgürel to offer up a positive image of himself and the PKK in a leading Turkish paper. However, it is strange that the PKK did not wait at least a little longer after the interview. Secondly, despite being the highest PKK commander, Karayilan may not be able to control all the groups within the PKK and perhaps this attack was organized by a group acting independently. Or thirdly, Özgürel “creatively interpreted” what Karayilan told him. This not only puts the past month in a new light, but also the past couple of years. According to Kalkan, last year’s attack in Silvan then was not a reaction to the failed talks, but part of a larger strategy. But it is also a declaration of bankruptcy by this arm of the PKK. In a period of intensive talks about a new constitution that also accommodated Kurdish identity and language demands, with an active civil society and political movement pressing for reforms, to declare the political strategy as invalid, can only mean that this wing wants to continue its attacks and killings to torpedo any progress. They are afraid to lose what influence they have, that is why they insist on continuing the meaningless fighting. And this might have been the main motivation for Leyla Zana to approach the prime minister – being fed up with the continuing violence, the bloodshed, more bodies returning to Turkish and Kurdish families. This is why she is being attacked by the PKK, a movement for which she became a symbol and this is the reason why she has so much support – among Kurdish and Turkish civil society. What Zana, the government and all those interested in a political solution should do is to continue the negotiations despite the attacks, which will increase the more likely a solution becomes. Until now, governments have stepped back after violent attacks, as happened in 1993. If this time the government persists, there is a real chance of reaching an agreement, because perhaps for the first time the PKK-related movement is really divided and an important figure has opted for peace.